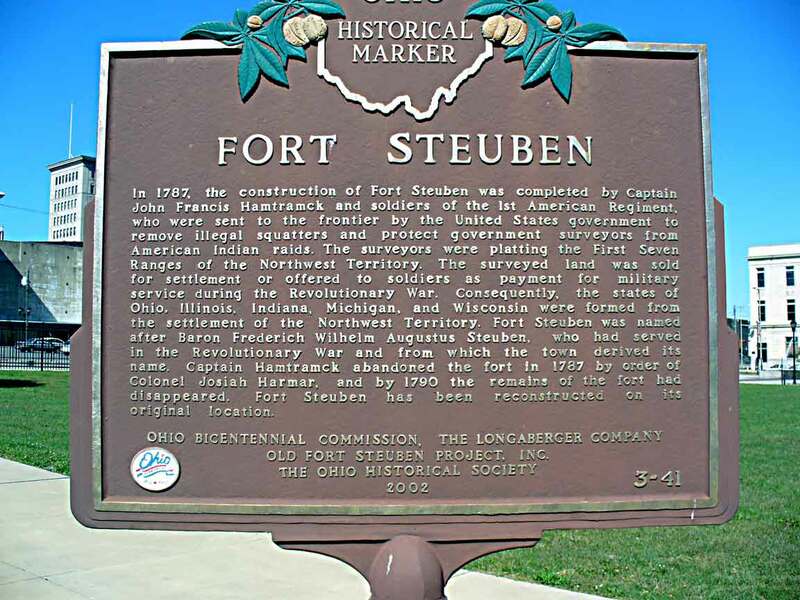 Ft Steuben is located in Steubenville, Ohio, on the Ohio River. The address is 120 S. Third Street, and email is info@oldfortsteuben.com - A very informative web site is at www.oldfortstebuen.com The fort was constructed in 1786-7 in the newly acquired Northwest Territory (which comprised all the land north of the Ohio River, east of the Mississippi River and south of the Great Lakes. It was built by elements of the First American Regiment commanded by Captain (Major) John Francis Hamtramck. The garrison (and construction force) was comprised of 136 enlisted men and14 officers - plus the surveyors and various civilians including one hired as a hunter to bring in game for food. No sooner was the fort completed than the soldiers were ordered to move elsewhere in Ohio. The fort was abandoned and was destroyed by 1790. However, sufficient remains and information were available for the Franciscan University of Steubenville to begin an archeological exploration. This, with the support of various civic and non-profit groups has resulted in a very fine reconstruction of the original fort plus an adjacent museum. The fort welcomes individuals and groups for tours between May and October. The fort is a simple square with curtain walls 150 feet on the side and a 25 foot square one and a half story block house at each corner. Each block house is divided into two rooms with a chimney in the center. Along the palisade walls there are buildings for officer's quarters, quartermaster stores, artificer shop and supplies, a commissary and a hospital. There are three gates. The northwest block house viewed from outside the fort. The northwest ( on right) and northeast block houses with the palisade and entrance gate between them. The high hill is across the Ohio River and was cut back to provide an area for building a highway along the river. The northwest block house viewed from the entrance path outside the fort. The northeast block house viewed from outside the fort. The Ohio River is visible to the left and behind the blockhouse. Manikin of a soldier of the First American Regiment in the parlor room of the officers' quarters building. Major Hamtramck's portable, traveling bed with a Hudson Bay Blanket (used in the fur trade). The black lines denote the prices in beaver pelts (3 large and one small). There are also the bed warmer, chamber pot, tall boots, desk, chair, sword and pipe. The interior of the quartermaster's shop. It now contains many of typical tools in use in the 1780's Note the samples of various animal pelts. The interior of the quartermaster's work shop. It now contains many of typical tools in use in the 1780's The man in white costume is the huner hired to supply meat. View of the north wall of the fort with the hospital and commissary buildings long the wall and the northeast corner block house. In the center is a current archeological site. Interior of the artificer's shop with many tools of the period. Interior of the artificer's work shop with many typical tools. The northeast block house viewed from inside the fort. Interior of the hospital building. The unit doctor was John Elliott. Medical practice was rudimentary in those days. A serious wound to the torso was likely to be deadly. But wounds to the extremities might be saved, however amputation was common. Interior of the hospital showing many of the herbs and medicines used at the fort. Interior of the commissary building - showing the carcass of a deer brought in by the hired professional hunter - Andrew van Swearingen. The beef was supplied from Pittsburg, preserved in salt in barrels. Other barrels contained flour, whiskey, slat and bacon all supplied by civilian contractors. Interior of the commissary building . The beef was supplied from Pittsburg, preserved in salt in barrels. Other barrels contained flour, whiskey, salt and bacon all supplied by civilian contractors. The commissary officer was Captain John Mills, a veteran of the Revolutionary War. Two manikins dressed as soldier of the First American Regiment and a civilian hunter. Adjacent to Ft Steuben is the building for the First Federal Land Office in Ohio - it was moved from its original location some distance away. It was built in 1801 and was the home also of the first land agent, David Hoge. The huge bell is from the Jefferson Country Courthouse. The building now is a museum with several valuable original documents. A model of the fort - located in the adjacent museum. Another view of the model of the fort - in background is a print depicting the fort. Another view of the model of the fort - in background is a print depicting the fort. The two towers next to the gate have not been reconstructed. Several model soldiers with a cannon in the fort model. The county courthouse across the street from the museum. Steubenville was a much richer city during the immediate post WWII era when there were many more factories along the river. Return to Xenophon. Return to Ruscity. Return to Rushistory. Return to Ukraine. Please leave us a note or comment at our guestbook.